Kim was called to the Bar in 2017 and has a broad civil law practice. 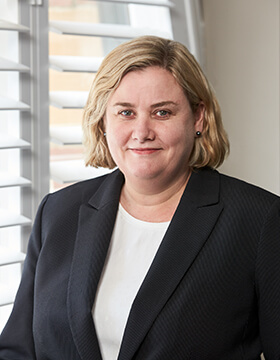 Prior to coming to the Bar, Kim practised as a solicitor in commercial and civil litigation law in England and Wales, New South Wales and Queensland. Most recently, she was a Solicitor at the Seniors Rights Service, an independent legal centre. Kim has represented her legal centre at the United Nations in New York and has presented papers at international conferences on compliance with elder rights regulation and its relationship with consumer law and human rights. Kim was appointed to the NSW Minister of Fair Trading’s Retirement Villages Advisory Council in 2013 and also to the Minister’s Expert Committee on Retirement Villages Standard Contract Terms and Disclosure Documents from 2011 to 2013. Kim was appointed to the inaugural Legal Services Council from October 2014 to 2017 and was reappointed from 2017 to 2020. She is a member of the International Commission of Jurists Australia and the NSW Bar Association.